Another superlative recording, this one from 1976, from the Mulligan label which released so many trend-setting albums, among which those of the Bothy Band, during the 1970s. Andy Irvine, a talented singer and multi-instrumentalist, was a member of Sweeney's Men and Planxty in earlier years, while Paul Brady, at one time a member of the Johnstons with Mick Moloney, had briefly played with Planxty just before the group disbanded. 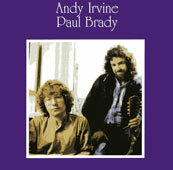 Irvine and Brady continued on as a duet for a couple of years, and their working together resulted in this wonderful album, featuring outstanding song arrangements which clearly owe much to what had been done in Planxty, but take it a step further thanks to the uncommon versatility and virtuosity of the two musicians. Irvine's Eastern-European inflected arrangement of "Plains of Kildare" and Brady's extraordinary guitar work on "Arthur McBride" in particular are among the special moments here--but one could argue that the whole album is just one special moment. Kevin Burke's fluid fiddle playing brings a welcome contrast to the plucked string sound, especially on the dance tunes.